This year I’ll be co-writing a book with Paul called “The Social Ripple.” In the book we will share some interesting concepts on how you can actually guide your social ripple to help your business or your own life succeed. Not only am I’m thrilled to work on such a meaningful project with one of my biggest role models and business crushes, I’m excited to share with you some profound stories and examples where this kind of social influence has transformed businesses and changed lives, including my own. Nothing is more critical than a baby’s first year. 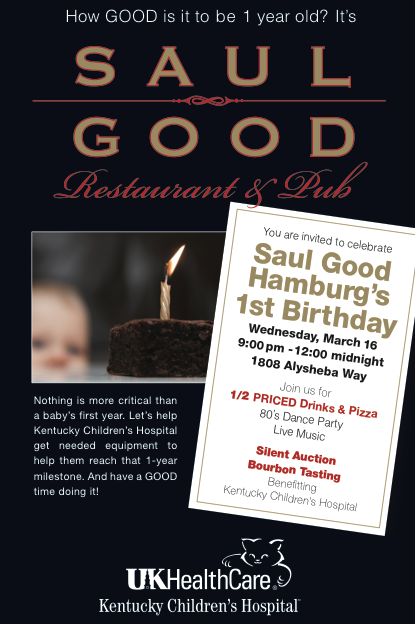 Let’s help Kentucky Children’s Hospital get needed equipment to help them reach that 1-year milestone. And have a GOOD time doing it.